When it comes to immigrants’ contributions to American culture, the story often starts with a restaurant featuring the food of the new arrival’s homeland. That happened to be the case for the family of Ming Tsai — whose popularity as a TV chef makes him among the best-known participants in the Frontera 30th Anniversary Celebration, the fundraiser for Chef Rick Bayless‘ Frontera Farmer Foundation and FamilyFarmed that takes place this Sunday (April 30) at The Art Institute of Chicago. For many years, Ming’s parents — both immigrants from China — owned, and his mother ran, a restaurant in Dayton, Ohio, called Mandarin Kitchen. Ming worked there during his teen years and showed his obvious talent and passion for cooking. But… this is an ethnic food story with a twist. Ming followed the education-first philosophy of his parents and started to follow in his father’s footsteps, studying mechanical engineering at Yale University. 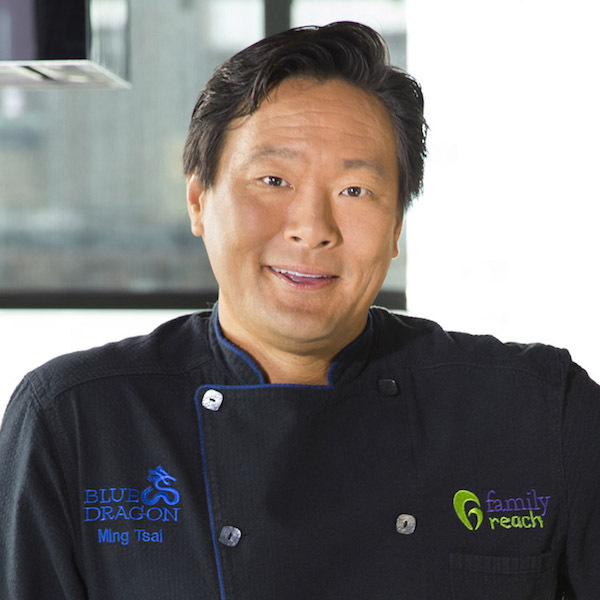 But cooking was never far from his mind, and though he achieved his Ivy League degree, he embarked on a career that led to his successful Blue Ginger flagship restaurant in Wellesley, Massachusetts; the Blue Dragon in Boston; and a long career as a TV chef that for the past 14 years has propelled his Simply Ming show on public television. 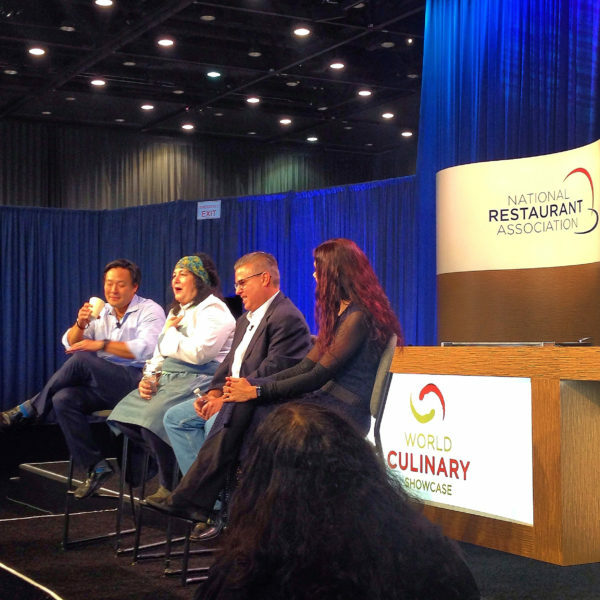 Last May, Ming Tsai participated in a panel at the National Restaurant Association Show in Chicago titled America: A Global Melting Pot, with fellow chefs Carrie Nahabedian of Chicago’s Naha; Richard Sandoval, whose eponymous restaurant group is one of the world’s largest; and Rohini Dey of Chicago’s Vermilion. Ming’s comments about ethnic food, a career as a chef and cooking on TV are excerpted below (click here to see a video with all of the chefs’ commentary). 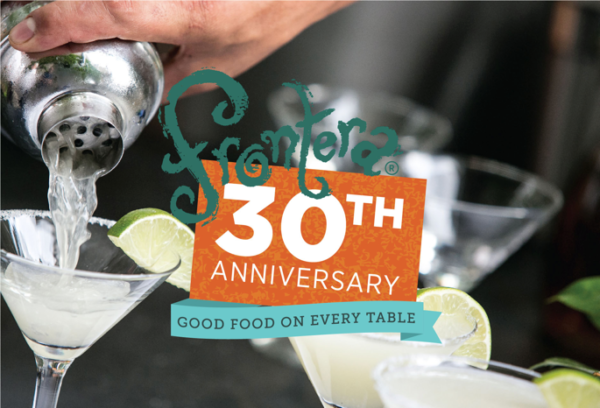 You can meet Rick and Ming at Sunday’s Frontera 30th Anniversary Celebration (click here for more information and tickets). And even if you cannot attend, you can participate in the amazing online silent auction (click here), the proceeds from which will help the Frontera Farmer Foundation and FamilyFarmed expand their efforts to assist family farmers and food entrepreneurs and accelerate the Good Food movement. Global flavors taste better. People are so much more well-traveled. People go to Thailand now or they go to Mexico and they taste the real lemongrass this or the real chipotle that. And when they come back to the States, they’re demanding those flavors. And because this world is so small now, you can get every product so easily… It’s forcing us chefs to do better, which is great, it’s a good pressure to have. And you throw in the whole marketing of the web, of TV, all that, people see new flavors, new techniques, people demand that. It’s keeping us chefs honest which is great. To the young cooks and chefs out there… Learn how you traditionally use certain things from those cultures. I use sesame oil as the best example. In Chinese cuisine, we put a tablespoon of sesame oil in four quarts of chicken stock and that’s all you need. You get a new cook and he’ll take sesame oil and put it on a tuna carpaccio like it’s extra virgin olive oil, you’ll taste sesame oil for four courses, and you’ve ruined the dining experience. I’ve always said you have to learn the traditional way before you earn the right to start blending, so that’s key. Just because a dish has never been done does not make it a good dish. Maybe peanut butter and escargot should not go together. Right? “Oh my God, it’s a new dish, no one’s ever done this before.” Maybe it shouldn’t be done. Ming on Why the Quality of Chinese Food is Better in the U.S. I think now, like other cuisines, it’s not just Chinese. It’s Szechuan, Hunan. It’s specific chefs coming from specific regions… we’re getting the real chefs here. And when they come here, they’re amazed because the products are much better. It’s the only way to get a Chinese chef to not cook with MSG. I was just in Hunan about a week ago and they’ve got the three powders, the salt, the sugar and the MSG, and they still use it. And the whole rationale… was, “Our quality of meat, our quality of product, is so much lower than you have, we need this.” I’m not going to argue with 1.2 billion, they’re pretty smart. But here we’ve got great product, so you can actually elevate Indian, Chinese and Mexican cuisine. The worst food in the world is bad fusion. That’s con-fusion cuisine. That’s lemongrass with sesame oil with Indian curry with Greek yogurt with creme fraiche, boom, vinaigrette! Horrible. Horrible. Similar to most cultures, Indian families, Jewish families, education was job one. We had three choices: doctor, lawyer, engineer… I was working at my mom’s restaurant in Dayton, Ohio, at age 14, 15, 16, in the Mandarin Kitchen… They knew I had a knack for cooking and they knew I loved, I was passionate, I was happiest when I was cooking with my grandparents and my parents. Does it help business? Of course, it can help business. People see you on TV and it says, Blue Ginger can be found in Wellesley, I’ll get everyone one time. But you’ve still got to produce. You’ve still got to make a great experience. In fact, people often come with a chip on their shoulder and they’ll say, “This better be the best meal I’ve had in my life.” I’m not better than 5,000 other chefs in this country, but because I’m in the black box, they presume this better be the best meal ever. I always joke, “I hope you just ate at McDonald’s or something.” I’m a good chef like everyone else up here, but am I the best chef? Hell, no, not even close. Fried savory. Anything fried, anything salty. It can be a potato chip, it can be chicharrones, anything fried savory. I used to binge, but I don’t binge anymore. I’m 52, so you can’t be binging on French fries anymore. Everything in moderation. 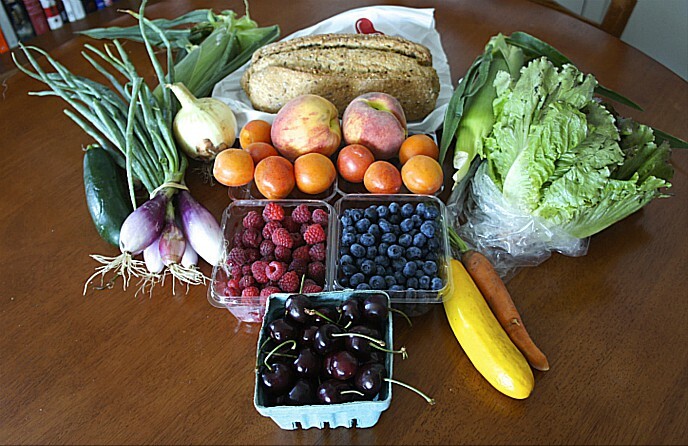 I’ll say this, it’s so important, eat what you want all the time, but in moderation. The 2017 National Restaurant Association Show will be held May 20-23 at Chicago’s McCormick Place convention center. This entry was posted in Food Artisans, Food Entrepreneurs, Frontera 30th Anniversary Celebration, Frontera Farmer Foundation, Good Food business development, Good Food Dining, Good Food restaurant trends, Good Food Success Stories, Restaurants and Good Food, Sustainable dining and tagged Blue Dragon restaurant, Blue Ginger restaurant, Chef Rick Bayless, Emeril Lagasse, FamilyFarmed, Food Network, Frontera 30th Anniversary Celebration, Frontera Farmer Foundation, Frontera Grill, Mexico One Plate at a Time, Ming Tsai, Naha, National Restaurant Association, Richard Sandoval Restaurants, Simply Ming TV show, television chefs, Vermilion restaurant. Bookmark the permalink. 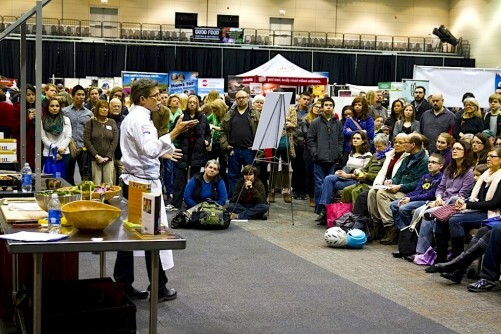 ← Connect (And Party) With Rick Bayless… CEOs of Presence Marketing, KeHE and SPINS… and Support Family Farmers Too!